Thanks are given for the invitation made by Professor Carlos Oxom, Maya Q’eqchi’, to share the Maya writing with students of the Institute for Teachers in Bilingual Primary Schools (Q’eqchi’-Spanish) Intercultural Program, a program of the Development Project Santiago-PRODESA. 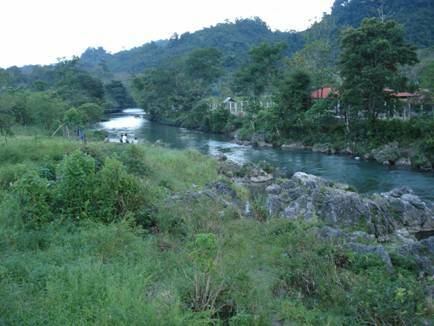 Having known the work of Professor Carlos Oxom in the subject of promotion and distribution and education in the Maya culture, we decided to accept the invitation since he has participated in epigraphy courses given in Coban. 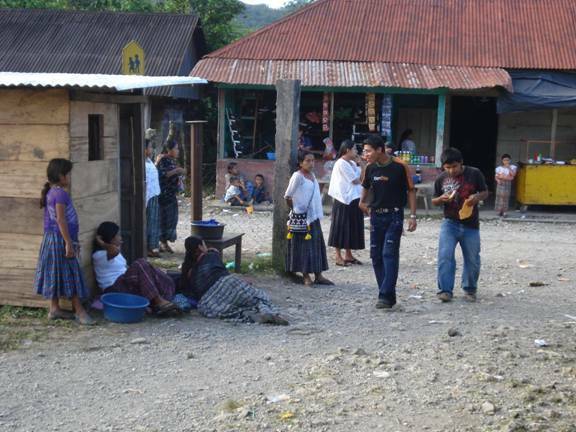 Lancetillo is a community damaged by the armed violence (described by some Mayas as the third holocaust suffered by the Maya nations) in the 80s, we can still notice in the social-cultural surroundings the terrible consequences suffered by its inhabitants. Up to recently the access to the above mentioned community was by dirt road. Recently the paved road was built. 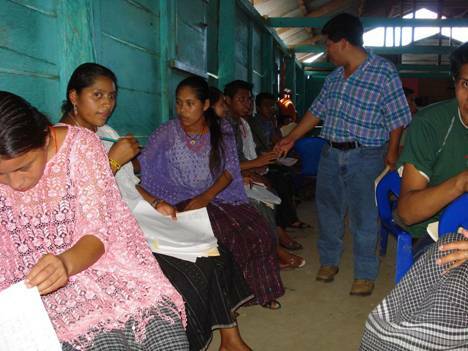 For a long time the Guatemalan government has neglected the development of Lancetillo and other nearby communities. 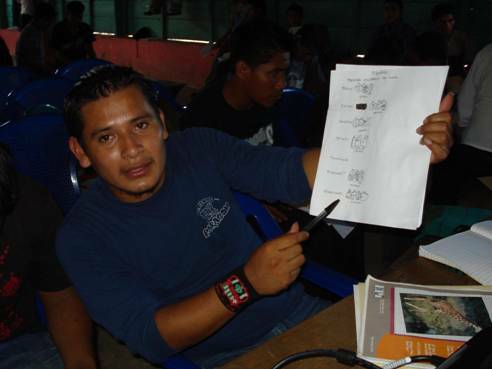 The goal of this workshop was to allow the Billingual Teaching School students to have knowledge of the writing and painting among the Mayas, since they had only spoken about ancient Maya knowledge but had never been able to write words in this system. We worked with 70 people including students and their 3 teachers. Most of them are Maya Q’eqchi’. 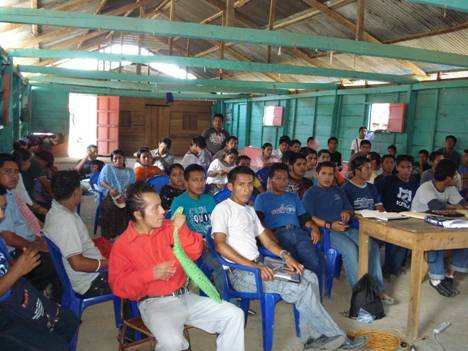 There were also some Ixil, Poqomchi’ and K’iche’ speakers, but all speak Q’eqchi’. The greatest pleasure for me was to have had the whole seminar totally in Q’eqchi’. 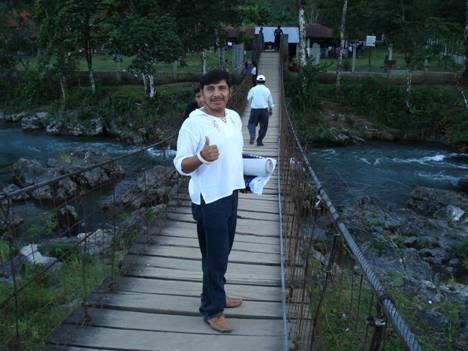 Profesor Hector, arriving in the Education Center. 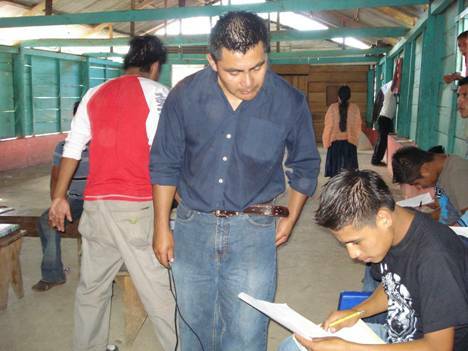 Poqomchi’ professor, but a Q’eqchi’ speaker, supervising the activities of the students. Hugo, presenting the words that he wrote using the writing of his ancestors. Any place is good to practice ancestral writing. Normally in the seminars we encourage team work and try to avoid individuality. Revising and correcting the assignments. Participants, taking a break near the classroom where the seminar took place. In Lancetillo, Uspantan Quiché. Feb. 7, 2011. 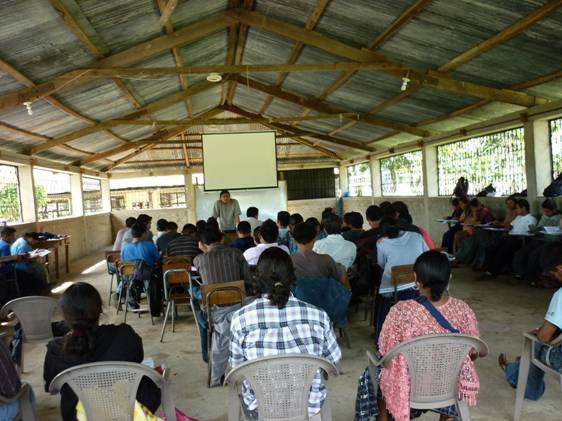 This workshop objective was to follow up the first one that took place in 2009. The students are in level 6 in the Bilingual Elementary Education (Maya-Spanish) Intercultural. 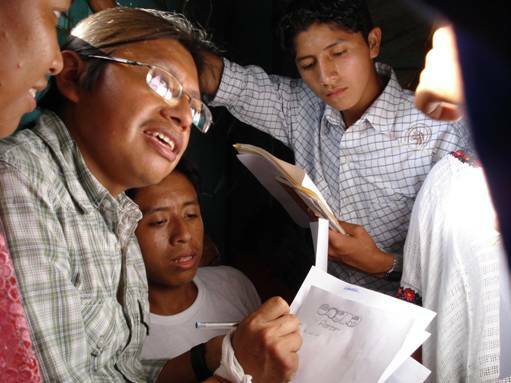 A film was shown about the development of the maya writing. 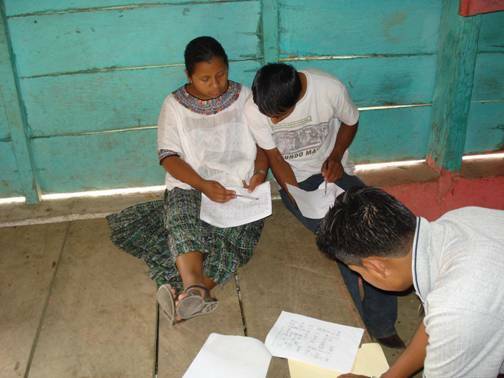 Analysis of the characteristics of the maya ancient maya writing and the writing and reading rules. 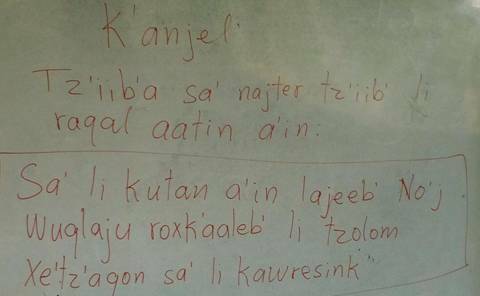 We did exercises on the use of the syllabary in the Maya Q’echi’ language. Finally, description of the maya books that are in Dresden and Madrid. We feel motivated to see the happiness and the excitement that the Maya participants show in the workshop, because they see the connection of the knowledge that their elders practiced and that they had heard about from their parents and their grandparents. This makes them feel that their roots have deep historical meaning. The enthusiasm and interest of the students makes us commit to continue working with them, therefore the next workshop will take place the first week of June 2011. 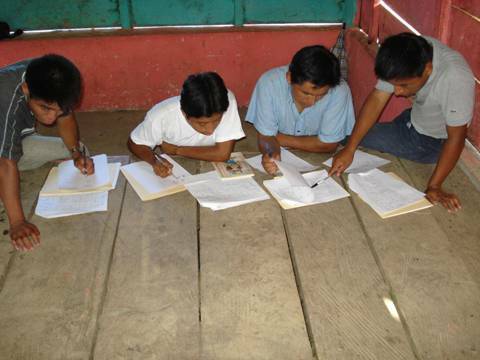 Students of the Teaching School of Lancetillo, Reyna Zone. 67 persons participated. 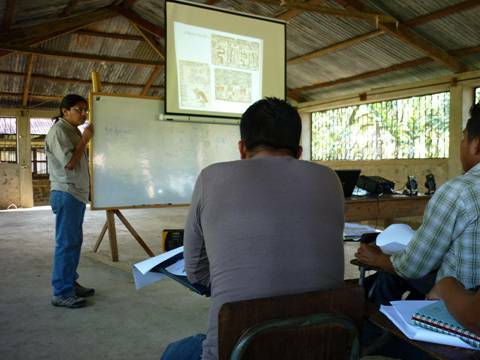 Describing aspects of the ancient Maya books, Maya codices.